This plan is so cool. I love the way it looks before the flowers bloom fully. I should know what this is because I purchased and planted it. I guess the squirrels or the wind removed the tag. Does anybody recognize it? Cool shot of the Laurel. (looks like a Bog Laurel). 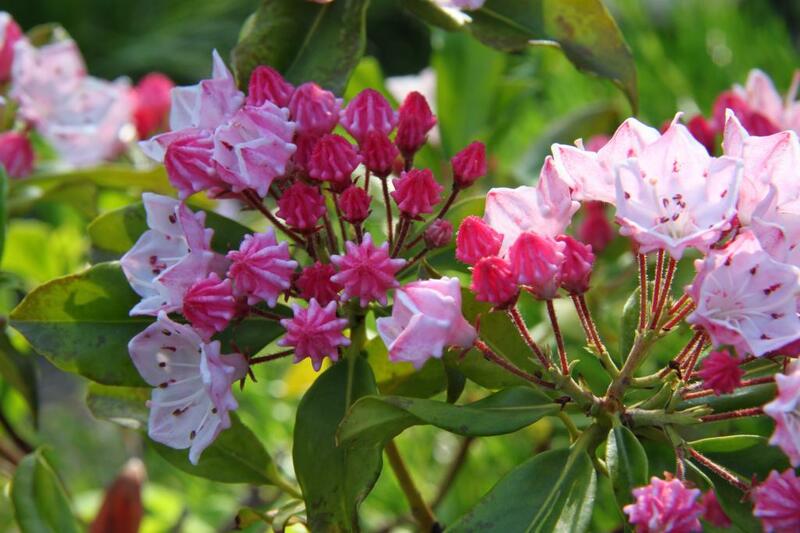 There are only six native Laurels in North America. Two, this one, and Lambkill, are poisonous to livestock. nice one. looks like Mountain laurel to these eyes. We have masses of it down here. Pale pink and sort of rangy looking...I like them. it is a neat plant. Very pretty. Thanks, and here I thought it was a hydrangea. They are actually closely related to Rhododendrons. You got me curious, so I checked the bill. It is an Olympic Fire Mountain Laurel. This year is the first time it flowered. I also bought a hydrangea that day, thus the confusion I guess. It still looks pretty neat. I like unusual plants. Rhododendrens and hydrangea and obviously mountain laurel. Plants that don't thrive in Southern Alberta. :( Very pretty plant, Fred. It kind of reminded me of a rhodie from the leaf structure.